What's on my USA Beauty Wishlist? I head to US next week and of course, as with any place I go to, I will be doing a fair amount of shopping while I'm there. 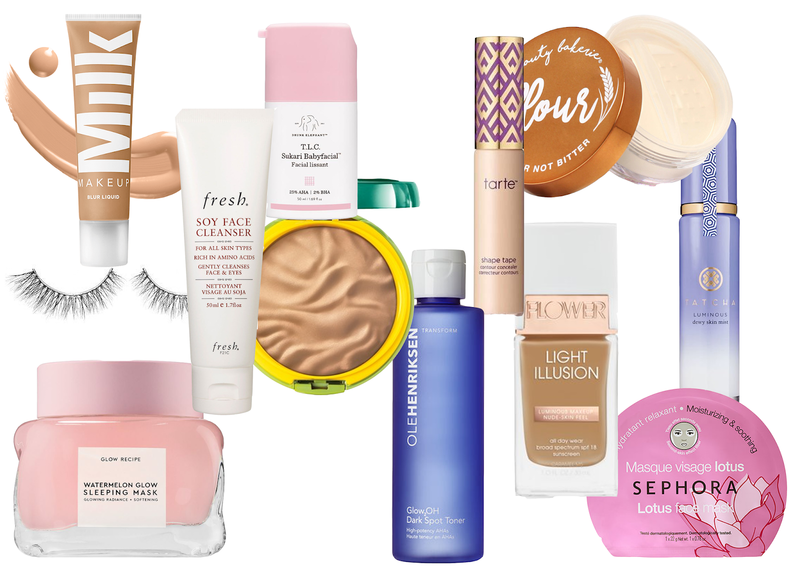 The last time I went to the US was about 6 years ago and since then, most beauty brands have now been brought over to places like Beauty Bay and Cult Beauty so the majority of cult products are available within easy reach. There are a few items I've wanted to get hold of because we can't try here or because they're cheaper across the pond. I believe Milk Makeup has launched on Cult Beauty this week. To be honest, it's not a brand I've been that aware of but after doing some research I have come across loads of people raving about their products. Foundation is one of my favourite beauty products, I wear it every day and have always been completely obsessed with trying new ones so the Milk Makeup Blur Liquid is on my wishlist to give a go. Drunk Elephant recently came to the UK and there is so much hype around it, I've not made a purchase yet as I feel like major research needs to be done before I part with that much money however I am so intrigued by the Baby Facial. It's won awards like the Allure Best of Beauty and In The Style's Best Beauty Buys so it's definitely making waves in the beauty industry. It's an AHA/BHA facial which resurfaces your skin to improve its texture to give you a glow. My skin has recently completely cleared up but I still have dull skin so I'm really excited to give this a go. The Glow Recipe Watermelon Glow Sleeping Mask is a product I've actually heard very little about but any kind of product which contains the words 'glow' sounds okay to me. I love using overnight hydrating masks and this just sounds so luxurious for the skin, I'm definitely going to read a few more reviews on it but I will probably still end up buying it. For some reason recently, I've become obsessed with false lashes and have been wearing them every day. I have stick straight lashes that do not hold a curl so lashes give me the drama I really need. I've read a few good things about the Sephora Luxe False Lashes and because they're so affordable, I'm going to pick one or two (or three) pairs up. I've also heard good things about the Sephora Face Masks and as I'm in the US on my own, I think I'm going to spend a few evenings in my hotel room watching chic flicks and treating my skin to some love! Recently, I listened to a podcast with the founder of Fresh Beauty and decided to have a look at their products. I'm running out of my Glossier Milky Jelly Cleanser (the best cleanser I've ever tried FYI) and am intrigued to try their Soy Face Cleanser. I've recently realised they do actually stock their products in the UK too! Sticking with skincare, Jamie Genevieve mentioned the Ole Henriksen Glow2Oh Dark Spot Toner on her Instagram and her skin has been looking incredible recently so it's been at the back of my mind for a while. I don't have dark spots but I do have some scarring on my cheeks which I'm trying to fade so I'm really interested to see how I get on with it. I will probably go to drugstores too while I'm over there, when I was researching drugstore products, the one that came up again and again was the Physicians Formula Bronzers. Apparently these are incredible and really affordable too, I've seen they do highlighters as well so will definitely check those out too. The product that's been on my wishlist the longest is the Tarte Shape Tape Concealer. You can get this at QVC in the UK but I'm not really sure which shade to get so I thought I'd wait until I can test it out properly at Ulta. I'm so excited to try this out as I'm running out of the Charlotte Tilbury Magic Away Concealer which I've been using for the past few months. Flower Beauty is the range created by Drew Barrymore, it's really affordable and I've seen a few people try their products. I of course really want to try the foundation to see what it's like. I'm absolutely dying to try the Beauty Bakerie Foundation, I believe you can only buy it online which is frustrating but I also want to give their loose powder a go. Hopefully I'll be able to get the foundation soon once I work out which shade I'd be! The final product I want, is the Tatcha Luminous Dewy Skin Mist. This is loved by celebrities and is their secret to creating a gorgeous healthy glow on the skin. Tatcha is a brand I heard everywhere so I may also do research into which products are worth buying from them. Do you have any other product recommendations and items I should pick up while I'm away?